I went to overnight camp two different times in my life. The first time was a social nightmare and had my BFF not stuck it out with me, I would have left rather quickly. The second time was more enjoyable, but I didn't come home boasting of any lifelong friendships. When I went to an overnight youth group retreat in the winter of 1990, I became close friends with a girl my age, all due to our similar hairstyles. Twenty-four years later and it's like no time has passed. 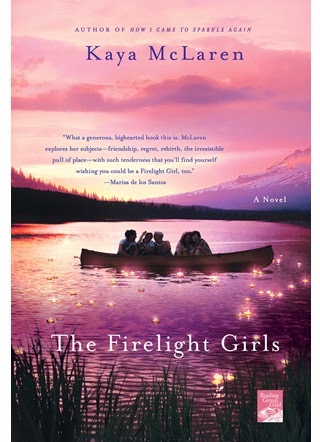 So that allowed me to relate to the friendships made at overnight camp in The Firelight Girls by Kaya McLaren. I read How I Came to Sparkle Again a couple of years ago and loved it so much that when I heard Kaya had a new book out (thanks to a post from Liz and Lisa), I made sure to get my hands on a copy as soon as possible. Kaya has such a genuine approach to all her characters, allowing us to witness their flaws and weaknesses early on and feel sympathetic towards them right away. I really enjoyed the female bonding aspect and how all the women of various ages stuck together. This bond shows how age doesn't matter when it comes to friendship and we are all women with hopes and dreams who have seen our shares of hardship and pure happiness in our lives. There's also a powerful message of forgiveness running through the story. There was a unique aspect of this story as well, since Ethel was a lesbian. Not many books explore this topic and this one showed how much times have changed in terms of what people accepted back in the 1950s and 1980s, as compared to the present day. Her relationship with Haddie was sweet, while also being realistic about the challenges that come with going against what everyone else wants for you, just for the sake of true love. Amber's part of the story is my favorite. It reminds me once again that I need to read more young adult novels and step outside of my usual genre a bit. I was really impressed with how Amber found ways to survive and fend for herself and the kinship she felt with the other women once she was discovered. While some parts felt slow, such as when the women were talking philosophically about their lives, I liked how everything came together in the story overall, as well as the interactions between the various characters. It was a beautifully told story and it made me want to find more ways to connect to our readers and allow them to become more involved with this blog and on social media. Of course, I had casting ideas in my mind while reading this novel. Thanks to St. Martin's Press for the book in exchange for an honest review. They have one copy for a lucky US reader! US only. Giveaway ends February 9th at midnight EST. I only have online friendships with ladies younger or older then I am. So, it's hard to really relate to one that is in someone's personal life. I have a friend who I've known since birth. She is 5 months older than I. We grew up next door to each other. We were so close that after first grade, our teachers decided to put is in different classes. When we were twelve, we both moved but kept in touch and visited occasionally. When we were 21, her sister died unexpectedly. Instinctively, I dropped everything and traveled to spend the weekend with my lifetime friend. We do not have to talk all the time, but we will remain forever friends. My best friend for the last forty years and I have a ten year age difference. I am the younger of us, and yet you would never know that if you found us together. Not talking about how we look, although right now I look much older than she does, but how young she is in spirit no matter what life hands her. Wouldn't have wanted to go through any of our experiences without her. I work with with an older lady that is not only my co worker but a friend. I love listening to her stories, advice, and recipes. I would want to be friends with Meryl Streep. I have a friend who we go back to our grandparents being friends first, then our fathers, and we came next. Literally have known her since birth. Now our children and grandchildren are friends. We go long periods where we don't see each other but can pick up at any time as if it was yesterday! I would love to be friends with Julie Andrews! And Meryl Streep. My friend Rebecca is almost 10 years older than me! Does that count? I was friends with a neighbor who was about 50 years older than me. She was single and had no children. Our common interest were books. She had lots of old books and let me peruse them occasionally. For my wedding gift she gave me a book with gems for a married woman. Fun stuff. LOL I treasure it though. I think it was printed in the early 1900. Not sure how she got the book--maybe she was engaged at one time. Anyway, when she knew she didn't have much time left, she had me come visit her and select a bunch of books from her collection. I still have most of them.
. We laughed and talked every day, worked together for about 8 years. She was coming back from a dr appointment after getting a clean bill of health, she stopped with her daughter to get some water, had a heart attack and was DOA when they got her to the hospital. That was 7 years ago and I still think about her every day. I have a friend that is almost 10 years older than me, but to me she seems timeless because she's got such a fresh outlook on life! I love being around her. I would love to become friends with Mary Higgins Clark. I am friends with all of my neighbors who are young enough to be my kids. I am 65 and they are all in their early to mid 40s. I am also friends with others who are in their 70s and 80s. Age has never mattered to me. I would love to be friends with Laura Dern, who is much older than I am. i have friends of all ages. i would love to be friends with Betty White! can you imagine the stories she could tell!?! I would love to be friends with Diane Keaton. Good friends I have made that are ten years or older were friends I made while I worked at the hospital. Sadly most of these friends have passed on as it's been years since I worked there. I've moved away and lost touch over the years. Most of my friends now are friends I made at university and here in the town I live in. My best friend is my daughter and what a great friend she is. Helen Mirren is a celebrity at least ten years older than me who I think it would be fun to be friends with. Diane Keaton would be my choice for a celebrity friend. She seems down to earth and I think we would have loads of fun. I'd want to be friends with Melissa McCarthy...I bet she's a hoot to hang out with and she seems really nice. I would want to be friends with Betty White!! One of my coworkers is 44 and I am 28. We have a lot of fun though! I used to work with a woman about 25 years older than me and we got along great! We were so surprised to find that we had many of the same interests even though there was such an age difference. Around the end of 2012 my mom went to lunch with a group of women (co-workers at the time she worked with at the casino) and she decided to ask me if I'd be interested in going because I live at home and I'm on the autism spectrum. I knew it would be a great time! During this luncheon, I met Maria. Right away I loved her for her warmth, sense of humor, and the way she made me feel as if I was the only person in the room. My mom has known Maria since Maria was 16 years old and my mom was a young single mother and Maria would babysit for my much older brothers before I was born. Ever since that day, I have bugged my mom at least once a week to go over to Maria's house. On Super Bowl Sunday Maria and her husband invited my parents and I over to their house to watch the game and have a good time. Maria is the kindest, most gentle, loving, woman in the entire world. What is even better, her cooking is amazing! She is the one who would give you the shirt off her back, the one who would drop everything to help you out in any situation. If I drove, I would be over her house almost every day. She has two teen boys and I'm like the daughter she never had. She always tells the best stories. Even though we don't see each other too often because of work and other things going on in our lives, when we do get together, it is like no time has passed at all. I volunteered at the Nursing Home where my Mom worked and I became friends with one of the lady's, her name was Mary and I would always go and visit and She always gave me great advice and we always had a lot of fun talking and playing cards. RIP Mary.